Here's a page of easy recipes to help you use your bountiful beans. Beans are so easy to grow that it is a task to find good ways of using them. These fresh green bean recipes are really easy to prepare and quite delicious. Place the scrubbed new potatoes into a steamer and cook them for around 10 or 15 minutes, until they are just beginning to show less resistance to being prodded with a fork. Take the lid off the steamer and add the fresh chopped whole broad beans. You need small, clean-looking, whole beans for this - two to four inches long is good. Discard any large beans, or damaged pods. After another 5 to 10 minutes the beans should be cooked, as well as the potatoes. While you wait for them, lightly fry a small shallot or onion, a little fresh, organic ham and a few chopped fresh ripe tomatoes. This should take no more than about 5 minutes, unless you like your onion well cooked. Turn out the beans and potatoes onto a serving dish and add the other ingredients. A little fresh goats cheese and a turn of the pepper mill, completes the dish. You can also add fresh herbs such as a little rocket or tarragon. Don't overdo it, as the fresh broad beans are exceptionally tasty. 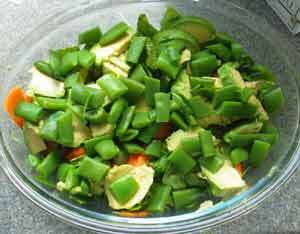 You can use other types of fresh green beans. Choose, young non-stringy beans for best results. Pre-cook the beans (runners or pole beans) in salted water for 3 or 4 minutes. If you prefer you can steam them. When cooked, refresh them in cold water and put them aside. Heat the mixture in a pan or skillet. When the oil is hot, add the beans and heat them through. Serve as a side dish. Fresh fava beans can also be used to make a wonderful addition to soups and stews. This next recipe is one of the simplest of fresh green bean recipes. The green beans need to be lightly cooked so that they are reasonably tender but not mushy. Steam them for best results. If you are boiling them it is especially important that you refresh them in cold water. This takes the heat out of them and to stops them from cooking further. Serve them with sliced ripe avocado, freshly ground black pepper and a few good glugs of olive oil. You can add in other ingredients such as green salad leaves or tomatoes if you wish. Herbs, such as cilantro (coriander), parsley or chervil are a welcome addition. Chop them fairly finely and add before serving.